It's the first lick, the wobbly crawl and the cut on your finger from putting it in their mouth when you shouldn't have. It's the first lick, the wobbly crawl and the cut on your finger from putting it in their mouth when you shouldn't have. These soft, cuddly friends come into our lives, and we grow with them. They become our friends long before they are housebroken, stop tearing things up and crying in the middle of the night. So we cooked up a special dish with lots of TLC that we think transitions them nicely from their momma's milk and welcomes them to earth but still with a firm handshake. At Merrick we call it Puppyhood and without Merrick in their life, well it's pretty much boredom. They're gonna grow up sooner or later and find Merrick on their own so you might as well have the "talk" now. 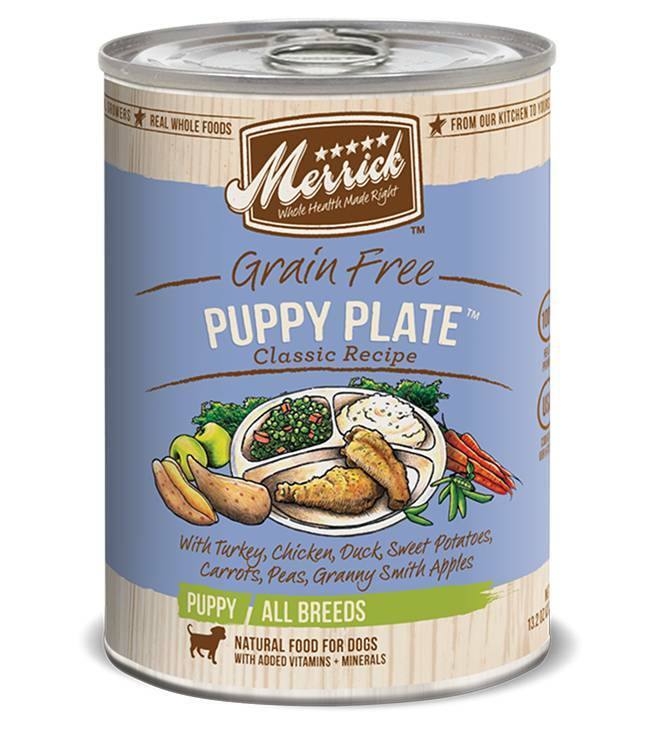 Merrick Classic Grain Free Puppy Plate™ Canned Puppy Food contains no artificial colors, flavors or preservatives. It contains delicious all natural home-style chunks that your pup will love. Deboned Turkey, Chicken Broth, Chicken, Duck, Peas, Sweet Potato, Carrots, Apples, Potato, Dried Egg Product, Natural Chicken Flavor, Carrageenan, Calcium Carbonate, Potassium Chloride, Vitamins (Choline Chloride, Vitamin E Supplement, Vitamin B12, d-Calcium Pantothenate, Vitamin A Supplement, Niacin, Vitamin D3 Supplement, Riboflavin, Pyridoxine Hydrochloride, Folic Acid, Biotin, Thiamine Mononitrate), Guar Gum, Salt, Sodium Phosphate, Cassia Gum, Canola Oil, Olive Oil, Flax Oil, Minerals (Zinc Amino Acid Complex, Iron Amino Acid Complex, Manganese Amino Acid Complex, Copper Amino Acid Complex, Potassium Iodide, Cobalt Glucoheptonate, Sodium Selenite), Thyme, Sage, Rosemary, Yucca Schidigera Extract, Lecithin.